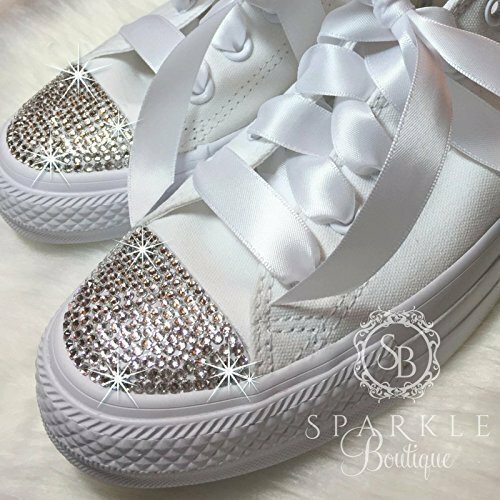 SWAROVSKI Crystal Wedding Converse - ALL White Low Top! If you need HI Tops I have a listing for them! Perfect for the beautiful Bride on her special day or for the bridal shower!! They would also be great for Quinceañera, Sweet 16 or Prom! *** IF YOU NEED THESE IN A RUSH - PLEASE MESSAGE ME TO ASK IF YOUR SHOE SIZE IS AVAILABLE FOR A RUSH ORDER. A RUSH ORDER WILL PUT YOU TO TOP PRIORITY AND WILL COST A EXTRA $20 Custom Bling WHITE Chuck Taylor All Star Converse! ** Converse run about a half size big. Please choose your perfect size. These will be covered on the front toe area in Swarovski Crystals or BLING Crystals (see photo for details). There will be a little extra bling on the tongue (star) and the back too. White satin laces are included to dress them up even more and give them their final touch! Nike Wedding Slides available in my store! ✨ Industrial glue is used to make sure all crystals stay nicely in place. ✨ All shoes come with some "Just in case crystals" and a care instruction note! Disclaimer: I am not associated with Converse or Swarovski - I simply purchase what you order and customize them. I look forward to hearing from you with any questions ‍ Please keep a eye on your email incase I need to reach you throughout the process of your custom order. If you have any questions about this product by Sparkle Boutique Custom Bling, contact us by completing and submitting the form below. If you are looking for a specif part number, please include it with your message.